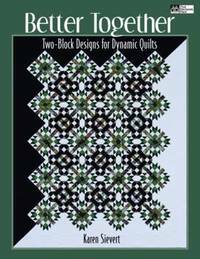 Learn how to create stunning quilt designs using just one repeating block, or two alternating block patterns. Create a few quilt blocks, put them together, and stand back for exciting results! The individual blocks are striking, but it's the settings that create the magic. Deceptively simple, each of the 10 projects in "Better Together" features either one repeating block or two alternating blocks. Where the blocks intersect, the lines blur from one block to the next, creating gorgeous and unexpected designs. Karen Sievert is an award-winning quilter and former quilt shop owner. She currently teaches quilting and runs her own long-arm quilting business.